On behalf of the men and women of the Greater Naples Fire Rescue District, I welcome you to our website. We hope the time spent with us will be enjoyable and you find the information both informative and interesting. The Greater Naples Fire Rescue District is a high performance emergency service provider. Our MISSION is to protect life and property by providing emergency response services and education for the residents, businesses and visitors of our community. The organization is the largest independent fire district in the State of Florida, providing emergency response and life safety services to the Chokoloskee, Everglades City, Golden Gate, East Naples, Isles of Capri, Port of the Islands, and surrounding communities. 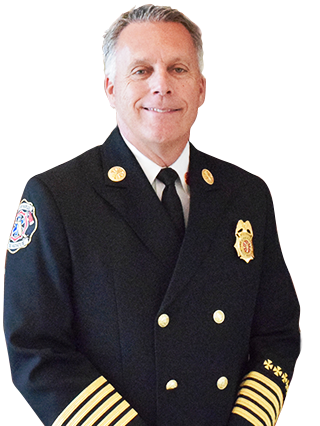 The Fire District is governed by a Board of five elected Fire Commissioners, and proudly staffs 225 uniform firefighters and civilian support staff. The Fire District deploys emergency apparatus from 15 fire-rescue stations. In addition, the Fire District manages a variety of support operations from six additional facilities including Administration, Fire & Life Safety, Training and Special Operations, Logistics, and Fleet Maintenance. Our fire service professionals provide services to more than 160,000 residents living and working within the District’s 1,512 square miles. In 2017, our fire service professionals responded to 20,927 emergency incidents and conducted 8,277 life safety inspections within the Greater Naples Fire Rescue District and Collier County at-large. In addition to providing fire and life safety services to its residents the Fire District provides fire marshal services to Collier County, overseeing new building construction fire plans review to the County’s staff of professional Fire Plans Reviewers, as well as fire inspection services the County may need. Our VISION is to increase response effectiveness, enhance professionalism and operational efficiencies and use taxpayer dollars responsibly, while holding ourselves accountable to earn your trust. This vision guides us daily as we serve our community and visitors. The Fire District’s core VALUES include Professionalism, Integrity and Compassion. Our membership strives to meet these in every aspect of their service delivery and community outreach. On behalf of the Board of Fire Commissioners, firefighters, fire inspectors, administrative staff and support, thank you for allowing us to serve you. Enjoy your visit and feel free to complete our Customer Satisfaction Survey if we have provided you service, sign up to receive the Chief’s Weekly Email, and don’t forget to follow us on Facebook, Twitter and Instagram for the most up to date information about our organization. If you would like to learn more about the District and services provided, never hesitate to contact any of our fire service professionals for additional information. On behalf of the entire membership, thank you for allowing us the opportunity to serve our community.